These highlights do not include all the information needed to use MAXALT and MAXALT-MLT safely and effectively. See full prescribing information for MAXALT and MAXALT-MLT. MAXALT® and MAXALT-MLT® are indicated for the acute treatment of migraine with or without aura in adults and in pediatric patients 6 to 17 years old. MAXALT should only be used where a clear diagnosis of migraine has been established. If a patient has no response for the first migraine attack treated with MAXALT, the diagnosis of migraine should be reconsidered before MAXALT is administered to treat any subsequent attacks. MAXALT is not indicated for use in the management of hemiplegic or basilar migraine [see Contraindications (4)]. MAXALT is not indicated for the prevention of migraine attacks. Safety and effectiveness of MAXALT have not been established for cluster headache. The recommended starting dose of MAXALT is either 5 mg or 10 mg for the acute treatment of migraines in adults. The 10-mg dose may provide a greater effect than the 5-mg dose, but may have a greater risk of adverse reactions [see Clinical Studies (14.1)]. Although the effectiveness of a second dose or subsequent doses has not been established in placebo-controlled trials, if the migraine headache returns, a second dose may be administered 2 hours after the first dose. The maximum daily dose should not exceed 30 mg in any 24-hour period. The safety of treating, on average, more than four headaches in a 30-day period has not been established. Dosing in pediatric patients is based on the patient's body weight. The recommended dose of MAXALT is 5 mg in patients weighing less than 40 kg (88 lb), and 10 mg in patients weighing 40 kg (88 lb) or more. The efficacy and safety of treatment with more than one dose of MAXALT within 24 hours in pediatric patients 6 to 17 years of age have not been established. For MAXALT-MLT Orally Disintegrating Tablets, administration with liquid is not necessary. Orally disintegrating tablets are packaged in a blister within an outer aluminum pouch and patients should not remove the blister from the outer pouch until just prior to dosing. The blister pack should then be peeled open with dry hands and the orally disintegrating tablet placed on the tongue, where it will dissolve and be swallowed with the saliva. In adult patients taking propranolol, only the 5-mg dose of MAXALT is recommended, up to a maximum of 3 doses in any 24-hour period (15 mg) [see Drug Interactions (7.1) and Clinical Pharmacology (12.3)]. For pediatric patients weighing â‰¥40 kg (88 lb) taking propranolol, only a single 5-mg dose of MAXALT is recommended (maximum dose of 5 mg in a 24-hour period). MAXALT should not be prescribed to propranolol-treated pediatric patients who weigh less than 40 kg (88 lb) [see Drug Interactions (7.1) and Clinical Pharmacology (12.3)]. 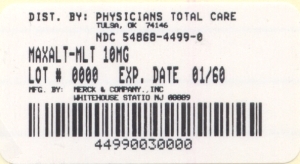 5 mg tablets are pale pink, capsule-shaped, compressed tablets coded MRK on one side and 266 on the other. 10 mg tablets are pale pink, capsule-shaped, compressed tablets coded MAXALT on one side and MRK 267 on the other. 5 mg orally disintegrating tablets are white to off-white, round lyophilized tablets debossed with a modified triangle on one side. 10 mg orally disintegrating tablets are white to off-white, round lyophilized tablets debossed with a modified square on one side. Ischemic coronary artery disease (angina pectoris, history of myocardial infarction, or documented silent ischemia), or other significant underlying cardiovascular disease [see Warnings and Precautions (5.1)]. Coronary artery vasospasm including Prinzmetal's angina [see Warnings and Precautions (5.1)]. History of stroke or transient ischemic attack (TIA) [see Warnings and Precautions (5.4)]. Peripheral vascular disease (PVD) [see Warnings and Precautions (5.5)]. Recent use (i.e., within 24 hours) of another 5-HT1 agonist, ergotamine-containing medication, or ergot-type medication (such as dihydroergotamine or methysergide) [see Drug Interactions (7.2 and 7.3)]. Concurrent administration or recent discontinuation (i.e., within 2 weeks) of a MAO-A inhibitor [see Drug Interactions (7.5) and Clinical Pharmacology (12.3)]. Hypersensitivity to MAXALT or MAXALT-MLT (angioedema and anaphylaxis seen) [see Adverse Reactions (6.2)]. MAXALT should not be given to patients with ischemic or vasospastic coronary artery disease. There have been rare reports of serious cardiac adverse reactions, including acute myocardial infarction, occurring within a few hours following administration of MAXALT. Some of these reactions occurred in patients without known coronary artery disease (CAD). 5-HT1 agonists including MAXALT may cause coronary artery vasospasm (Prinzmetal's Angina), even in patients without a history of CAD. Triptan-naïve patients who have multiple cardiovascular risk factors (e.g., increased age, diabetes, hypertension, smoking, obesity, strong family history of CAD) should have a cardiovascular evaluation prior to receiving MAXALT. If there is evidence of CAD or coronary artery vasospasm, MAXALT should not be administered [see Contraindications (4)]. For patients who have a negative cardiovascular evaluation, consideration should be given to administration of the first MAXALT dose in a medically-supervised setting and performing an electrocardiogram (ECG) immediately following MAXALT administration. Periodic cardiovascular evaluation should be considered in intermittent long-term users of MAXALT who have cardiovascular risk factors. Life-threatening disturbances of cardiac rhythm, including ventricular tachycardia and ventricular fibrillation leading to death, have been reported within a few hours following the administration of 5-HT1 agonists. Discontinue MAXALT if these disturbances occur. As with other 5-HT1 agonists, sensations of tightness, pain, pressure, and heaviness in the precordium, throat, neck and jaw commonly occur after treatment with MAXALT and are usually non-cardiac in origin. However, if a cardiac origin is suspected, patients should be evaluated. Patients shown to have CAD and those with Prinzmetal's variant angina should not receive 5-HT1 agonists. Cerebral hemorrhage, subarachnoid hemorrhage, and stroke have occurred in patients treated with 5-HT1 agonists, and some have resulted in fatalities. In a number of cases, it appears possible that the cerebrovascular events were primary, the 5-HT1 agonist having been administered in the incorrect belief that the symptoms experienced were a consequence of migraine, when they were not. Also, patients with migraine may be at increased risk of certain cerebrovascular events (e.g., stroke, hemorrhage, transient ischemic attack). Discontinue MAXALT if a cerebrovascular event occurs. As with other acute migraine therapies, before treating headaches in patients not previously diagnosed as migraineurs, and in migraineurs who present with atypical symptoms, care should be taken to exclude other potentially serious neurological conditions. MAXALT should not be administered to patients with a history of stroke or transient ischemic attack [see Contraindications (4)]. 5-HT1 agonists, including MAXALT, may cause non-coronary vasospastic reactions, such as peripheral vascular ischemia, gastrointestinal vascular ischemia and infarction (presenting with abdominal pain and bloody diarrhea), splenic infarction, and Raynaud's syndrome. In patients who experience symptoms or signs suggestive of non-coronary vasospasm reaction following the use of any 5-HT1 agonist, the suspected vasospasm reaction should be ruled out before receiving additional MAXALT doses. Overuse of acute migraine drugs (e.g., ergotamine, triptans, opioids, or a combination of drugs for 10 or more days per month) may lead to exacerbation of headache (medication overuse headache). Medication overuse headache may present as migraine-like daily headaches, or as a marked increase in frequency of migraine attacks. Detoxification of patients, including withdrawal of the overused drugs, and treatment of withdrawal symptoms (which often includes a transient worsening of headache) may be necessary. Serotonin syndrome may occur with triptans, including MAXALT particularly during co-administration with selective serotonin reuptake inhibitors (SSRIs), serotonin norepinephrine reuptake inhibitors (SNRIs), tricyclic antidepressants (TCAs), and MAO inhibitors [see Drug Interactions (7.5)]. Serotonin syndrome symptoms may include mental status changes (e.g., agitation, hallucinations, coma), autonomic instability (e.g., tachycardia, labile blood pressure, hyperthermia), neuromuscular aberrations (e.g., hyperreflexia, incoordination) and/or gastrointestinal symptoms (e.g., nausea, vomiting, diarrhea). The onset of symptoms can occur within minutes to hours of receiving a new or a greater dose of a serotonergic medication. MAXALT treatment should be discontinued if serotonin syndrome is suspected [see Drug Interactions (7.4) and Patient Counseling Information (17)]. Significant elevation in blood pressure, including hypertensive crisis with acute impairment of organ systems, has been reported on rare occasions in patients with and without a history of hypertension receiving 5-HT1 agonists, including MAXALT. In healthy young adult male and female patients who received maximal doses of MAXALT (10 mg every 2 hours for 3 doses), slight increases in blood pressure (approximately 2-3 mmHg) were observed. MAXALT is contraindicated in patients with uncontrolled hypertension [see Contraindications (4)]. Myocardial Ischemia, Myocardial Infarction, and Prinzmetal's Angina [see Warnings and Precautions (5.1)]. Arrhythmias [see Warnings and Precautions (5.2)]. Chest and or Throat, Neck and/or Jaw Pain/Tightness/Pressure [see Warnings and Precautions (5.3)]. Cerebrovascular Events [see Warnings and Precautions (5.4)]. Other Vasospasm Reactions [see Warnings and Precautions (5.5)]. Medication Overuse Headache [see Warnings and Precautions (5.6)]. Serotonin Syndrome [see Warnings and Precautions (5.7)]. Increase in Blood Pressure [see Warnings and Precautions (5.8)]. Adverse reactions to MAXALT were assessed in controlled clinical trials that included over 3700 adult patients who received single or multiple doses of MAXALT Tablets. The most common adverse reactions during treatment with MAXALT (â‰¥5% in either treatment group and greater than placebo) were asthenia/fatigue, somnolence, pain/pressure sensation and dizziness. These adverse reactions appeared to be dose related. Table 1 lists the adverse reactions (incidence â‰¥2% and greater than placebo) after a single dose of MAXALT in adults. The frequencies of adverse reactions in clinical trials did not increase when up to three doses were taken within 24 hours. Adverse reaction frequencies were also unchanged by concomitant use of drugs commonly taken for migraine prophylaxis (including propranolol), oral contraceptives, or analgesics. The incidences of adverse reactions were not affected by age or gender. There were insufficient data to assess the impact of race on the incidence of adverse reactions. In the following section, the frequencies of less commonly reported adverse events are presented that were not reported in other sections of the labeling. Because the reports include events observed in open studies, the role of MAXALT in their causation cannot be reliably determined. Furthermore, variability associated with adverse event reporting, the terminology used to describe adverse events, limit the value of the quantitative frequency estimates provided. Event frequencies are calculated as the number of patients who used MAXALT and reported an event divided by the total number of patients exposed to MAXALT (N=3716). All reported events occurred at an incidence â‰¥1%, or are believed to be reasonably associated with the use of the drug. Events are further classified within body system categories and enumerated in order of decreasing frequency using the following definitions: frequent adverse events are those defined as those occurring in at least (>)1/100 patients; infrequent adverse experiences are those occurring in 1/100 to 1/1000 patients; and rare adverse experiences are those occurring in fewer than 1/1000 patients. General: Infrequent was facial edema. Rare were syncope and edema/swelling. Atypical Sensations: Frequent were warm sensations. Cardiovascular: Frequent was palpitation. Infrequent were tachycardia, cold extremities, and bradycardia. Digestive: Frequent were diarrhea and vomiting. Infrequent were dyspepsia, tongue edema and abdominal distention. Musculoskeletal: Infrequent were muscle weakness, stiffness, myalgia and muscle cramp/spasm. Neurological/Psychiatric: Frequent were hypoesthesia, euphoria and tremor. Infrequent were vertigo, insomnia, confusion/disorientation, gait abnormality, memory impairment, and agitation. Respiratory: Frequent was dyspnea. Infrequent was pharyngeal edema. Special Senses: Infrequent were blurred vision and tinnitus. Rare was eye swelling. Skin and Skin Appendage: Frequent was flushing. Infrequent were sweating, pruritus, rash, and urticaria. Rare was erythema, hot flashes. The adverse reaction profile seen with MAXALT-MLT Orally Disintegrating Tablets was similar to that seen with MAXALT Tablets. Adverse reactions to MAXALT-MLT were assessed in a controlled clinical trial in the acute treatment of migraines (Study 7) that included a total of 1382 pediatric patients 6-17 years of age, of which 977 (72%) administered at least one dose of study treatment (MAXALT-MLT and/or placebo) [see Clinical Studies (14.2)]. The incidence of adverse reactions reported for pediatric patients in the acute clinical trial was similar in patients who received MAXALT to those who received placebo. The adverse reaction pattern in pediatric patients is expected to be similar to that in adults. In the following section, the frequencies of less commonly reported adverse events are presented. Because the reports include events observed in open studies, the role of MAXALT-MLT in their causation cannot be reliably determined. Furthermore, variability associated with adverse event reporting, the terminology used to describe adverse events, limit the value of the quantitative frequency estimates provided. Event frequencies are calculated as the number of pediatric patients 6 to 17 years of age who used MAXALT-MLT and reported an event divided by the total number of patients exposed to MAXALT-MLT (N=1068). All reported events occurred at an incidence â‰¥1%, or are believed to be reasonably associated with the use of the drug. Events are further classified within system organ class and enumerated in order of decreasing frequency using the following definitions: frequent adverse events are those occurring in (>)1/100 pediatric patients; infrequent adverse experiences are those occurring in 1/100 to 1/1000 pediatric patients; and rare adverse experiences are those occurring in fewer than 1/1000 patients. Ear and labyrinth disorders: Infrequent was hypoacusis. Gastrointestinal disorders: Frequent was abdominal discomfort. Nervous system disorders: Infrequent were coordination abnormal, disturbance in attention, and presyncope. Psychiatric disorders: Infrequent was hallucination. The following section enumerates potentially important adverse events that have occurred in clinical practice and which have been reported spontaneously to various surveillance systems. The events enumerated include all except those already listed in other sections of the labeling or those too general to be informative. Because the reports cite events reported spontaneously from worldwide postmarketing experience, frequency of events and the role of MAXALT in their causation cannot be reliably determined. General: Allergic conditions including anaphylaxis/anaphylactoid reaction, angioedema, wheezing, and toxic epidermal necrolysis [see Contraindications (4)]. The dose of MAXALT should be adjusted in propranolol-treated patients, as propranolol has been shown to increase the plasma AUC of rizatriptan by 70% [see Dosage and Administration (2.4) and Clinical Pharmacology (12.3)]. Ergot-containing drugs have been reported to cause prolonged vasospastic reactions. Because these effects may be additive, use of ergotamine-containing or ergot-type medications (like dihydroergotamine or methysergide) and MAXALT within 24 hours is contraindicated [see Contraindications (4)]. Because their vasospastic effects may be additive, co-administration of MAXALT and other 5-HT1 agonists within 24 hours of each other is contraindicated [see Contraindications (4)]. Cases of serotonin syndrome have been reported during co-administration of triptans and selective serotonin reuptake inhibitors (SSRIs) or serotonin norepinephrine reuptake inhibitors (SNRIs) [see Warnings and Precautions (5.7)]. MAXALT is contraindicated in patients taking MAO-A inhibitors and non-selective MAO inhibitors. A specific MAO-A inhibitor increased the systemic exposure of rizatriptan and its metabolite [see Contraindications (4) and Clinical Pharmacology (12.3)]. There are no adequate and well-controlled studies in pregnant women. MAXALT should be used during pregnancy only if the potential benefit justifies the potential risk to the fetus. In a general reproductive study in rats, birth weights and pre- and post-weaning weight gain were reduced in the offspring of females treated prior to and during mating and throughout gestation and lactation with doses of 10 and 100 mg/kg/day. In a pre- and post-natal developmental toxicity study in rats, an increase in mortality of the offspring at birth and for the first three days after birth, a decrease in pre- and post-weaning weight gain, and decreased performance in a passive avoidance test (which indicates a decrease in learning capacity of the offspring) were observed at doses of 100 and 250 mg/kg/day. The no-effect dose for all of these effects was 5 mg/kg/day, associated with a maternal plasma exposure (AUC) approximately 7.5 times that in humans receiving the MRDD. With doses of 100 and 250 mg/kg/day, the decreases in average weight of both the male and female offspring persisted into adulthood. All effects on the offspring in both studies occurred in the absence of any apparent maternal toxicity. In embryofetal development studies, no teratogenic effects were observed when pregnant rats and rabbits were administered doses of 100 and 50 mg/kg/day, respectively, during organogenesis. Fetal weights were decreased in conjunction with decreased maternal weight gain at the highest doses tested. The developmental no-effect dose in these studies was 10 mg/kg/day in both rats and rabbits (maternal exposures approximately 15 times human exposure at the MRDD). Toxicokinetic studies demonstrated placental transfer of drug in both species. Merck Sharp & Dohme Corp., a subsidiary of Merck & Co., Inc., maintains a registry to monitor the pregnancy outcomes of women exposed to MAXALT while pregnant. Healthcare providers are encouraged to report any prenatal exposure to MAXALT by calling the Pregnancy Registry at 1-800-986-8999. It is not known whether this drug is excreted in human milk. Because many drugs are excreted in human milk, caution should be exercised when MAXALT is administered to a nursing woman. Rizatriptan is extensively excreted in rat milk, with levels in milk at least 5-fold higher than levels in maternal plasma. Safety and effectiveness in pediatric patients under 6 years of age have not been established. The efficacy and safety of MAXALT in the acute treatment of migraine in patients aged 6 to 17 years was established in an adequate and well-controlled study [see Clinical Studies (14.2)]. The incidence of adverse reactions reported for pediatric patients in the acute clinical trial was similar in patients who received MAXALT to those who received placebo. The adverse reaction pattern in pediatric patients is expected to be similar to that in adults. Clinical studies of MAXALT did not include sufficient numbers of subjects aged 65 and over to determine whether they respond differently from younger subjects. Other reported clinical experience has not identified differences in responses between the elderly and younger patients. Although the pharmacokinetics of rizatriptan were similar in elderly (aged â‰¥65 years) and in younger adults (n=17), in general, dose selection for an elderly patient should be cautious, starting at the low end of the dosing range. This reflects the greater frequency of decreased hepatic, renal, or cardiac function, and of concomitant disease or other drug therapy. Geriatric patients who have other cardiovascular risk factors (e.g., diabetes, hypertension, smoking, obesity, strong family history of coronary artery disease) should have a cardiovascular evaluation prior to receiving MAXALT [see Warnings and Precautions (5.1)]. Orally Disintegrating Tablets contain phenylalanine (a component of aspartame). The 5 and 10 mg orally disintegrating tablets contain 1.1 and 2.1 mg phenylalanine, respectively. No overdoses of MAXALT were reported during clinical trials in adults. Some adult patients who received 40 mg of MAXALT either a single dose or as two doses with a 2-hour interdose interval had dizziness and somnolence. In a clinical pharmacology study in which 12 adult subjects received MAXALT, at total cumulative doses of 80 mg (given within four hours), two of the subjects experienced syncope, dizziness, bradycardia including third degree AV block, vomiting, and/or incontinence. In the long-term, open label study, involving 606 treated pediatric migraineurs 12 to 17 years of age (of which 432 were treated for at least 12 months), 151 patients (25%) took two 10-mg doses of MAXALT-MLT within a 24-hour period. Adverse reactions for 3 of these patients included abdominal discomfort, fatigue, and dyspnea. In addition, based on the pharmacology of MAXALT, hypertension or myocardial ischemia could occur after overdosage. Gastrointestinal decontamination, (i.e., gastric lavage followed by activated charcoal) should be considered in patients suspected of an overdose with MAXALT. Clinical and electrocardiographic monitoring should be continued for at least 12 hours, even if clinical symptoms are not observed. The effects of hemo- or peritoneal dialysis on serum concentrations of rizatriptan are unknown. Its empirical formula is C15H19N5C7H6O2, representing a molecular weight of the free base of 269.4. Rizatriptan benzoate is a white to off-white, crystalline solid that is soluble in water at about 42 mg per mL (expressed as free base) at 25°C. MAXALT Tablets and MAXALT-MLT Orally Disintegrating Tablets are available for oral administration in strengths of 5 and 10 mg (corresponding to 7.265 mg or 14.53 mg of the benzoate salt, respectively). Each compressed tablet contains the following inactive ingredients: lactose monohydrate, microcrystalline cellulose, pregelatinized starch, ferric oxide (red), and magnesium stearate. Each lyophilized orally disintegrating tablet contains the following inactive ingredients: gelatin, mannitol, glycine, aspartame, and peppermint flavor. Rizatriptan binds with high affinity to human cloned 5-HT1B/1D receptors. MAXALT presumably exerts its therapeutic effects in the treatment of migraine headache by binding to 5-HT1B/1D receptors located on intracranial blood vessels and sensory nerves of the trigeminal system. Rizatriptan is completely absorbed following oral administration. The mean oral absolute bioavailability of the MAXALT Tablet is about 45%, and mean peak plasma concentrations (Cmax) are reached in approximately 1-1.5 hours (Tmax). The presence of a migraine headache did not appear to affect the absorption or pharmacokinetics of rizatriptan. Food has no significant effect on the bioavailability of rizatriptan but delays the time to reach peak concentration by an hour. In clinical trials, MAXALT was administered without regard to food. The bioavailability and Cmax of rizatriptan were similar following administration of MAXALT Tablets and MAXALT-MLT Orally Disintegrating Tablets, but the rate of absorption is somewhat slower with MAXALT-MLT, with Tmax delayed by up to 0.7 hour. AUC of rizatriptan is approximately 30% higher in females than in males. No accumulation occurred on multiple dosing. The mean volume of distribution is approximately 140 liters in male subjects and 110 liters in female subjects. Rizatriptan is minimally bound (14%) to plasma proteins. The primary route of rizatriptan metabolism is via oxidative deamination by monoamine oxidase-A (MAO-A) to the indole acetic acid metabolite, which is not active at the 5-HT1B/1D receptor. N-monodesmethyl-rizatriptan, a metabolite with activity similar to that of parent compound at the 5-HT1B/1D receptor, is formed to a minor degree. Plasma concentrations of N-monodesmethyl-rizatriptan are approximately 14% of those of parent compound, and it is eliminated at a similar rate. Other minor metabolites, the N-oxide, the 6-hydroxy compound, and the sulfate conjugate of the 6-hydroxy metabolite are not active at the 5-HT1B/1D receptor. The total radioactivity of the administered dose recovered over 120 hours in urine and feces was 82% and 12%, respectively, following a single 10 mg oral administration of 14C-rizatriptan. Following oral administration of 14C-rizatriptan, rizatriptan accounted for about 17% of circulating plasma radioactivity. Approximately 14% of an oral dose is excreted in urine as unchanged rizatriptan while 51% is excreted as indole acetic acid metabolite, indicating substantial first pass metabolism. The plasma half-life of rizatriptan in males and females averages 2-3 hours. Rizatriptan is not an inhibitor of the activities of human liver cytochrome P450 isoforms 3A4/5, 1A2, 2C9, 2C19, or 2E1; rizatriptan is a competitive inhibitor (Ki=1400 nM) of cytochrome P450 2D6, but only at high, clinically irrelevant concentrations. Geriatric: Rizatriptan pharmacokinetics in healthy elderly non-migraineur volunteers (age 65-77 years) were similar to those in younger non-migraineur volunteers (age 18-45 years). Pediatric: The pharmacokinetics of rizatriptan was determined in pediatric migraineurs 6 to 17 years of age. Exposures following single dose administration of 5 mg MAXALT-MLT to pediatric patients weighing 20-39 kg (44-87 lb) or 10 mg MAXALT-MLT to pediatric patients weighing â‰¥40 kg (88 lb) were similar to those observed following single dose administration of 10 mg MAXALT-MLT to adults. Gender: The mean AUC0-âˆž and Cmax of rizatriptan (10 mg orally) were about 30% and 11% higher in females as compared to males, respectively, while Tmax occurred at approximately the same time. Hepatic impairment: Following oral administration in patients with hepatic impairment caused by mild to moderate alcoholic cirrhosis of the liver, plasma concentrations of rizatriptan were similar in patients with mild hepatic insufficiency compared to a control group of subjects with normal hepatic function; plasma concentrations of rizatriptan were approximately 30% greater in patients with moderate hepatic insufficiency. Renal impairment: In patients with renal impairment (creatinine clearance 10-60 mL/min/1.73 m2), the AUC0-âˆž of rizatriptan was not significantly different from that in subjects with normal renal function. In hemodialysis patients, (creatinine clearance <2 mL/min/1.73 m2), however, the AUC for rizatriptan was approximately 44% greater than that in patients with normal renal function. Race: Pharmacokinetic data revealed no significant differences between African American and Caucasian subjects. Monoamine oxidase inhibitors: Rizatriptan is principally metabolized via monoamine oxidase, 'A' subtype (MAO-A). Plasma concentrations of rizatriptan may be increased by drugs that are selective MAO-A inhibitors (e.g., moclobemide) or nonselective MAO inhibitors [type A and B] (e.g., isocarboxazid, phenelzine, tranylcypromine, and pargyline). In a drug interaction study, when MAXALT 10 mg was administered to subjects (n=12) receiving concomitant therapy with the selective, reversible MAO-A inhibitor, moclobemide 150 mg t.i.d., there were mean increases in rizatriptan AUC and Cmax of 119% and 41% respectively; and the AUC of the active N-monodesmethyl metabolite of rizatriptan was increased more than 400%. The interaction would be expected to be greater with irreversible MAO inhibitors. No pharmacokinetic interaction is anticipated in patients receiving selective MAO-B inhibitors [see Contraindications (4) and Drug Interactions (7.5)]. Propranolol: In a study of concurrent administration of propranolol 240 mg/day and a single dose of rizatriptan 10 mg in healthy adult subjects (n=11), mean plasma AUC for rizatriptan was increased by 70% during propranolol administration, and a four-fold increase was observed in one subject. The AUC of the active N-monodesmethyl metabolite of rizatriptan was not affected by propranolol [see Dosage and Administration (2.4) and Drug Interactions (7.1)]. Nadolol/Metoprolol: In a drug interactions study, effects of multiple doses of nadolol 80 mg or metoprolol 100 mg every 12 hours on the pharmacokinetics of a single dose of 10 mg rizatriptan were evaluated in healthy subjects (n=12). No pharmacokinetic interactions were observed. Paroxetine: In a study of the interaction between the selective serotonin reuptake inhibitor (SSRI) paroxetine 20 mg/day for two weeks and a single dose of MAXALT 10 mg in healthy subjects (n=12), neither the plasma concentrations of rizatriptan nor its safety profile were affected by paroxetine [see Warnings and Precautions (5.7), Drug Interactions (7.4), and Patient Counseling Information (17)]. Oral contraceptives: In a study of concurrent administration of an oral contraceptive during 6 days of administration of MAXALT (10-30 mg/day) in healthy female volunteers (n=18), rizatriptan did not affect plasma concentrations of ethinyl estradiol or norethindrone. Carcinogenesis: Oral carcinogenicity studies were conducted in mice (100 weeks) and rats (106 weeks) at doses of up to 125 mg/kg/day. Plasma exposures (AUC) at the highest dose tested were approximately 150 (mice) and 240 times (rats) that in humans at the maximum recommended daily dose (MRDD) of 30 mg/day. There was no evidence of an increase in tumor incidence related to rizatriptan in either species. Mutagenesis: Rizatriptan was neither mutagenic nor clastogenic in a battery of in vitro and in vivo genetic toxicity studies, including: the microbial mutagenesis (Ames) assay, in vitro mammalian cell mutagenesis and chromosomal aberration assays, and the in vivo chromosomal aberration assay in mouse. Impairment of Fertility: In a fertility study in rats, altered estrus cyclicity and delays in time to mating were observed in females treated orally with 100 mg/kg/day rizatriptan. The no-effect dose was 10 mg/kg/day (approximately 15 times the human exposure at the MRDD). There were no other fertility-related effects in the female rats. There was no impairment of fertility or reproductive performance in male rats treated with up to 250 mg/kg/day (approximately 550 times the human exposure at the MRDD). 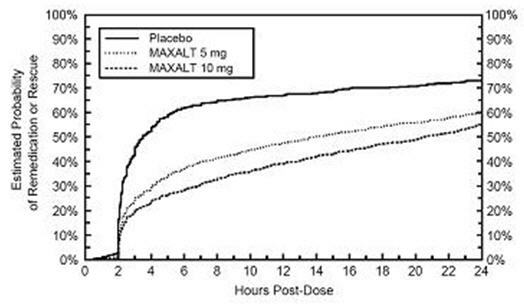 The efficacy of MAXALT Tablets was established in four multicenter, randomized, placebo-controlled trials. Patients enrolled in these studies were primarily female (84%) and Caucasian (88%), with a mean age of 40 years (range of 18 to 71). Patients were instructed to treat a moderate to severe headache. Headache response, defined as a reduction of moderate or severe headache pain to no or mild headache pain, was assessed for up to 2 hours (Study 1) or up to 4 hours after dosing (Studies 2, 3 and 4). Associated symptoms of nausea, photophobia, and phonophobia and maintenance of response up to 24 hours post-dose were evaluated. 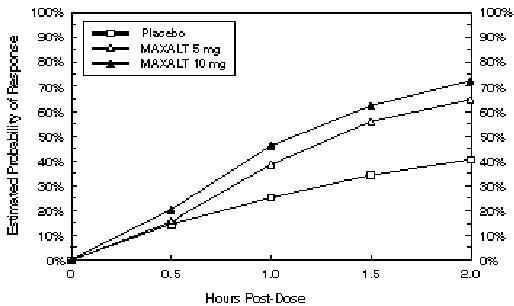 A second dose of MAXALT Tablets was allowed 2 to 24 hours after dosing for treatment of recurrent headache in Studies 1 and 2. Additional analgesics and/or antiemetics were allowed 2 hours after initial treatment for rescue in all four studies. In all studies, the percentage of patients achieving headache response 2 hours after treatment was significantly greater in patients who received either MAXALT 5 or 10 mg compared to those who received placebo. In a separate study, doses of 2.5 mg were not different from placebo. Doses greater than 10 mg were associated with an increased incidence of adverse effects. The results from the four controlled studies are summarized in Table 2. • Results for initial headache only. Comparisons of drug performance based upon results obtained in different clinical trials may not be reliable. Because studies are conducted at different times, with different samples of patients, by different investigators, employing different criteria and/or different interpretations of the same criteria, under different conditions (dose, dosing regimen, etc. ), quantitative estimates of treatment response and the timing of response may be expected to vary considerably from study to study. The estimated probability of achieving an initial headache response within 2 hours following treatment in pooled Studies 1, 2, 3, and 4 is depicted in Figure 1. • Figure 1 shows the Kaplan-Meier plot of the probability over time of obtaining headache response (no or mild pain) following treatment with MAXALT or placebo. The averages displayed are based on pooled data from 4 placebo-controlled, outpatient trials providing evidence of efficacy (Studies 1, 2, 3, and 4). Patients taking additional treatment or not achieving headache response prior to 2 hours were censored at 2 hours. For patients with migraine-associated photophobia, phonophobia, and nausea at baseline, there was a decreased incidence of these symptoms following administration of MAXALT compared to placebo. Two to 24 hours following the initial dose of study treatment, patients were allowed to use additional treatment for pain response in the form of a second dose of study treatment or other medication. The estimated probability of patients taking a second dose or other medication for migraine over the 24 hours following the initial dose of study treatment is summarized in Figure 2. • This Kaplan-Meier plot is based on data obtained in 4 placebo-controlled outpatient clinical trials (Studies 1, 2, 3, and 4). Patients not using additional treatments were censored at 24 hours. The plot includes both patients who had headache response at 2 hours and those who had no response to the initial dose. Remedication was not allowed within 2 hours post-dose. Efficacy was unaffected by the presence of aura; by the gender, or age of the patient; or by concomitant use of common migraine prophylactic drugs (e.g., beta-blockers, calcium channel blockers, tricyclic antidepressants) or oral contraceptives. In two additional similar studies, efficacy was unaffected by relationship to menses. There were insufficient data to assess the impact of race on efficacy. 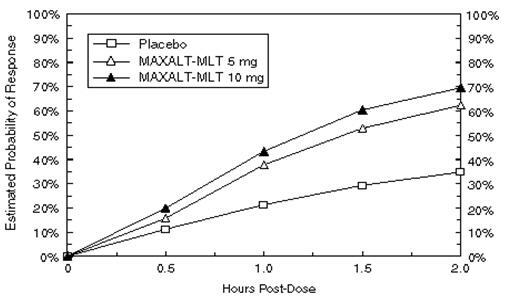 The efficacy of MAXALT-MLT was established in two multicenter, randomized, placebo-controlled trials that were similar in design to the trials of MAXALT Tablets (Studies 5 and 6). Patients were instructed to treat a moderate to severe headache. Patients treated in these studies were primarily female (88%) and Caucasian (95%), with a mean age of 42 years (range 18-72). In both studies, the percentage of patients achieving headache response 2 hours after treatment was significantly greater in patients who received either MAXALT-MLT 5 or 10 mg compared to those who received placebo. The results from Studies 5 and 6 are summarized in Table 3. The estimated probability of achieving an initial headache response by 2 hours following treatment with MAXALT-MLT in pooled Studies 5 and 6 is depicted in Figure 3. • Figure 3 shows the Kaplan-Meier plot of the probability over time of obtaining headache response (no or mild pain) following treatment with MAXALT-MLT or placebo. The averages displayed are based on pooled data from 2 placebo-controlled, outpatient trials providing evidence of efficacy (Studies 5 and 6). Patients taking additional treatment or not achieving headache response prior to 2 hours were censored at 2 hours. For patients with migraine-associated photophobia and phonophobia at baseline, there was a decreased incidence of these symptoms following administration of MAXALT-MLT as compared to placebo. Two to 24 hours following the initial dose of study treatment, patients were allowed to use additional treatment for pain response in the form of a second dose of study treatment or other medication. The estimated probability of patients taking a second dose or other medication for migraine over the 24 hours following the initial dose of study treatment is summarized in Figure 4. • This Kaplan-Meier plot is based on data obtained in 2 placebo-controlled outpatient clinical trials (Studies 5 and 6). Patients not using additional treatments were censored at 24 hours. The plot includes both patients who had headache response at 2 hours and those who had no response to the initial dose. Remedication was not allowed within 2 hours post-dose. The efficacy of MAXALT-MLT in pediatric patients 6 to 17 years was evaluated in a multicenter, randomized, double-blind, placebo-controlled, parallel group clinical trial (Study 7). Patients had to have at least a 6-month history of migraine attacks (with or without aura) usually lasting 3 hours or more (when untreated). The patient population was historically non-responsive to NSAIDs and acetaminophen therapy. Patients were instructed to treat a single migraine attack with headache pain of moderate to severe intensity. The treatment phase of the study had two stages. Stage 1 was used to identify placebo non-responders, who then entered into Stage 2, in which patients were randomized to MAXALT-MLT or placebo. 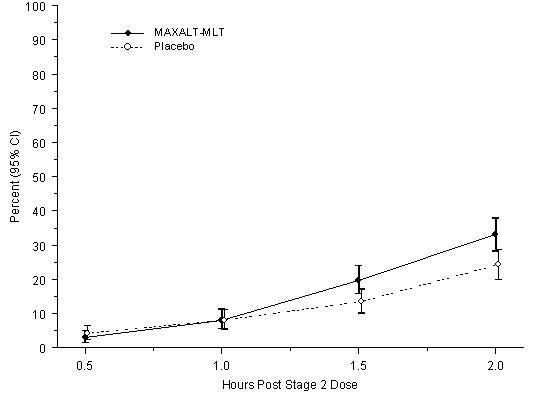 Using a weight-based dosing strategy, patients 20 kg to <40 kg (44 lb to <88 lb) received MAXALT-MLT 5 mg or placebo, and patients â‰¥40 kg (88 lb) received MAXALT-MLT 10 mg or placebo. The mean age for the studied patient population was 13 years. Sixty-one percent of the patients were Caucasian, and fifty-six percent of the patients were female. The percentage of patients achieving the primary efficacy endpoint of no headache pain at 2 hours after treatment was significantly greater in patients who received MAXALT-MLT, compared with those who received placebo (33% vs. 24%). Study 7 results are summarized in Table 4.
n = Number of evaluable patients with no headache pain at 2 hours post-dose. m = Number of evaluable patients in population. 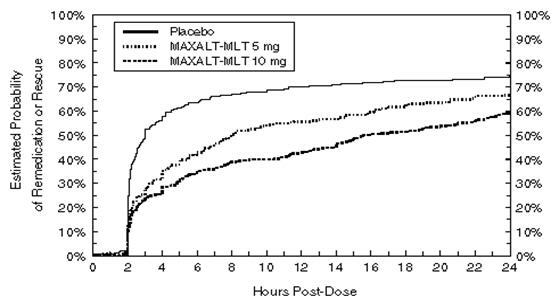 The observed percentage of pediatric patients achieving no headache pain within 2 hours following initial treatment with MAXALT-MLT is shown in Figure 5. The prevalence of the exploratory endpoints of absence of migraine-associated symptoms (nausea, photophobia, and phonophobia) at 2 hours after taking the dose was not statistically significantly different between patients who received MAXALT-MLT and those who received placebo. Store MAXALT Tablets at room temperature, 15-30°C (59-86°F). Store MAXALT-MLT Orally Disintegrating Tablets at room temperature, 15-30°C (59-86°F). Inform patients that MAXALT may cause serious cardiovascular side effects such as myocardial infarction or stroke. Although serious cardiovascular events can occur without warning symptoms, patients should be alert for the signs and symptoms of chest pain, shortness of breath, weakness, slurring of speech, and should ask for medical advice when observing any indicative sign or symptoms. Patients should be apprised of the importance of this follow-up [see Warnings and Precautions (5.1, 5.2, 5.4, 5.5)]. Patients should be cautioned about the risk of serotonin syndrome with the use of MAXALT or other triptans, particularly during combined use with selective serotonin reuptake inhibitors (SSRIs) or serotonin norepinephrine reuptake inhibitors (SNRIs) [see Warnings and Precautions (5.7), Drug Interactions (7.4), and Clinical Pharmacology (12.3)]. Inform patients that MAXALT should not be used during pregnancy unless the potential benefit justifies the potential risk to the fetus [see Use in Specific Populations (8.1)]. Advise patients to notify their healthcare provider if they are breastfeeding or plan to breastfeed [see Use in Specific Populations (8.3)]. Since migraines or treatment with MAXALT may cause somnolence and dizziness, instruct patients to evaluate their ability to perform complex tasks during migraine attacks and after administration of MAXALT. Inform patients that use of acute migraine drugs for 10 or more days per month may lead to an exacerbation of headache, and encourage patients to record headache frequency and drug use (e.g., by keeping a headache diary) [see Warnings and Precautions (5.6)]. Instruct patients not to remove the blister from the outer aluminum pouch until ready to use the orally disintegrating tablet inside [see Dosage and Administration (2.3)]. Inform phenylketonuric patients that MAXALT-MLT Orally Disintegrating Tablets contain phenylalanine (a component of aspartame). Each 5-mg orally disintegrating tablet contains 1.1 mg phenylalanine, and each 10-mg orally disintegrating tablet contains 2.1 mg phenylalanine [see Use in Specific Populations (8.6)]. Catalent UK Swindon, Zydis Ltd. 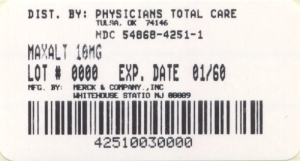 Copyright © 1998, 2006, 2011 Merck Sharp & Dohme Corp., a subsidiary of Merck & Co., Inc.
Read this Patient Information before you start taking MAXALT® and each time you get a refill. There may be new information. This information does not take the place of talking to your doctor about your medical condition or your treatment. Unless otherwise stated, the information in this Patient Information leaflet applies to both MAXALT Tablets and to MAXALT-MLT® Orally Disintegrating Tablets. MAXALT is a prescription medicine that belongs to a class of medicines called Triptans. MAXALT is available as a traditional tablet (MAXALT) and as an orally disintegrating tablet (MAXALT-MLT). MAXALT and MAXALT-MLT are used to treat migraine attacks with or without aura in adults and in children 6 to 17 years of age. MAXALT is not to be used to prevent migraine attacks. MAXALT is not for the treatment of hemiplegic or basilar migraines. It is not known if MAXALT is safe and effective for the treatment of cluster headaches. It is not known if taking more than 1 dose of MAXALT in 24 hours is safe and effective in children 6 to 17 years of age. It is not known if MAXALT is safe and effective in children under 6 years of age. Who should not take MAXALT? are allergic to rizatriptan benzoate or any of the ingredients in MAXALT. See the end of this leaflet for a complete list of ingredients in MAXALT. Talk to your doctor before taking this medicine if you have any of the conditions listed above or if you are not sure if you take any of these medicines. What should I tell my doctor before taking MAXALT? have phenylketonuria (PKU). MAXALT-MLT orally disintegrating tablets contain phenylalanine. are pregnant or plan to become pregnant. It is not known if MAXALT will harm your unborn baby. If you become pregnant while taking MAXALT, talk to your healthcare provider about registering with the pregnancy registry at the Merck National Service Center. You can enroll in this registry by calling 1-800-986-8999. The purpose of this registry is to collect information about the safety of MAXALT in pregnancy. are breastfeeding or plan to breastfeed. It is not known if MAXALT passes into your breast milk. Talk to your doctor about the best way to feed your baby if you take MAXALT. MAXALT and other medicines may affect each other causing side effects. MAXALT may affect the way other medicines work, and other medicines may affect how MAXALT works. medicines used to treat mood disorders, including selective serotonin reuptake inhibitors (SSRIs) or serotonin norepinephrine reuptake inhibitors (SNRIs). How should I take MAXALT? Take MAXALT exactly as your doctor tells you to take it. Your doctor will tell you how much MAXALT to take and when to take it. Remove the blister from the foil pouch. Do not push the MAXALT-MLT orally disintegrating tablet through the blister. Peel open the blister pack with dry hands and place the MAXALT-MLT orally disintegrating tablet on your tongue. The tablet will dissolve and be swallowed with your saliva. No liquid is needed to take the orally disintegrating tablet. For adults: a second dose may be taken 2 hours after the first dose. Do not take more than 30 mg of MAXALT in a 24-hour period (for example, do not take more than 3 10-mg tablets in a 24-hour period). For children 6 to 17 years of age: It is not known if taking more than 1 dose of MAXALT in 24 hours is safe and effective. Talk to your doctor about what to do if your headache does not go away or comes back. If you take too much MAXALT, call your doctor or go to the nearest hospital emergency room right away. What should I avoid while taking MAXALT? MAXALT may cause dizziness, weakness, or fainting. If you have these symptoms, do not drive a car, use machinery, or do anything that needs you to be alert. What are the possible side effects of MAXALT? If you take MAXALT too often, this may result in you getting chronic headaches. In such cases, you should contact your doctor, as you may have to stop taking MAXALT. These are not all the possible side effects of MAXALT. For more information, ask your doctor or pharmacist. How should I store MAXALT? Store MAXALT at room temperature between 59°F to 86°F (15°C to 30°C). Keep MAXALT and all medicines out of the reach of children. General Information about the safe and effective use of MAXALT. Medicines are sometimes prescribed for purposes other than those listed in a Patient Information leaflet. Do not use MAXALT for a condition for which it was not prescribed. Do not give MAXALT to other people, even if they have the same symptoms that you have. It may harm them. This Patient Information leaflet summarizes the most important information about MAXALT. If you would like more information, talk to your doctor. You can ask your pharmacist or doctor for information about MAXALT that is written for health professionals. For more information, go to www.maxalt.com or call 1-800-986-8999. What are the ingredients in MAXALT? Inactive ingredients in MAXALT: lactose monohydrate, microcrystalline cellulose, pregelatinized starch, ferric oxide (red), and magnesium stearate. Inactive ingredients in MAXALT-MLT orally disintegrating tablets: gelatin, mannitol, glycine, aspartame, and peppermint flavor. MAXALT-MLT orally disintegrating tablets contain aspartame, a source of phenylalanine. MAXALT-MLT orally disintegrating tablets 5-mg contain 1.1 mg of phenylalanine. MAXALT-MLT orally disintegrating tablets 10-mg contain 2.1 mg of phenylalanine. The brands listed are the trademarks of their respective owners. equivalent to 10 mg rizatriptan. Each tablet contains 14.53 mg of rizatriptan benzoate, equivalent to 10 mg rizatriptan. 2.10 mg per 10-mg orally disintegrating tablet. USUAL ADULT DOSAGE: See accompanying circular.